Crikey: would you believe it's been over a year since I last posted a Parker Progress Report? Long enough that I expect most Existential Ennui readers – and a good number of Violent World of Parker ones, too – have either forgotten what they are, or weren't even around for the last one (as in, weren't reading Existential Ennui, not weren't born; I've anecdotal and some reasonably scientific evidence – comments and stats, basically – that this blog has picked up a fair few new readers in the interim... although I guess some of those new readers could be babies). 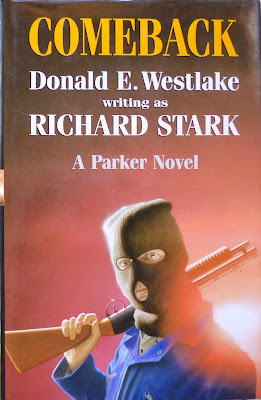 To recap then: since 2010 I've been blogging my way through Donald E. Westlake's twenty-four-book series starring taciturn heister Parker, which were written under the alias Richard Stark (Westlake also wrote four spin-off novels under the Stark alias featuring actor/thief Alan Grofield – those I covered as The Grofield Files). The last proper Parker Progress Report I posted, back in November 2011 – leaving aside this one on the Dortmunder novel Jimmy the Kid, which boasts a Parker meta-cameo – was on the sixteenth Parker, Butcher's Moon, originally published in 1974. So, seeing as January 2013 marks the beginning of what is to all intents and purposes the fiftieth anniversary of Parker, and since there's a new movie based on the nineteenth Parker, Flashfire, due any day now (at least, in the US; it's not out in the UK until March for some reason), I figured I'd try and rattle through the Parker Progress Reports in order to reach that book, starting with the seventeenth Parker, Comeback (1997). In a way, taking a year-long break between Parkers makes sense: after all, Comeback didn't appear until twenty-three years after Butcher's Moon, although you wouldn't guess that from reading it: the outside world may have changed, but not much has in the Parkerverse. Parker and his girlfriend, Claire, haven't aged, and neither have Parker's irregular cohorts, husband and wife heisting team Ed and Brenda Mackey (there's still no word on how Ed was resurrected having apparently died in Parker #15, Plunder Squad – that won't be addressed until Parker #21, Breakout). In fact the only real nod to change in the book is a mention that it's become harder to find cash scores – harder, but not impossible: the caper this time centres on an evangelical event at a stadium, where cash donations will total half a million dollars. Structurally, too, things are much as they ever were: like the bulk of its predecessors, the novel is made up of four parts; there's the expected jumping back and forth in time, and the inevitable double-cross – and it won't be a surprise to anyone familiar with the series to this point that that comes courtesy of the man who arranged the robbery, George Liss. Even so, Westlake does have other surprises up his sleeve, notably a new spin on Parker's traditional plan of finding a local hideout after the score, rather than making a run for it – although for me, that doesn't quite work here; the hideout is a little too close to the stadium for it to be believable – and Parker posing as an insurance man and winding up in a hospital teeming with cops. Still, to my mind, there's something missing from the book – that raw, searing intensity that the best Parkers – The Hunter, The Score, The Seventh – possess. There are some great scenes, some diverting business, but the novel never really coalesces or comes fully to life. That could be a consequence of the way it was written – in fits and starts over a twenty-plus year period, as Westlake explained in this 1997 interview by Jesse Sublett. Or maybe he just needed time to warm up. 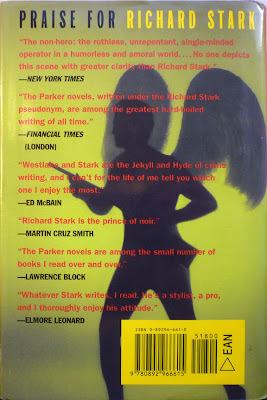 Either way, the next Parker novel, Backflash (1998), was written much faster, the way Westlake usually penned the Parkers, and for my money it's a better book – something I'll be exploring in the next Parker Progress Report. Personally, I love this one. Probably because George Liss is such an effective antagonist--the last part of the book is so atmospheric, and it's one of the most satisfying final confrontations in the whole series. Liss just does not make it easy for Parker. Of course Parker makes it even harder for Liss. So I see what you're saying, but I much prefer it to most of the other novels of the Second Era, so to speak. It's still got a lot of the feel of the classic Parkers--he's not 100% into the modern age yet. Westlake kind of fudges about how much time has passed--really just a short time since Butcher's Moon. But more and more, he makes it clear that EVERYTHING has changed, and I don't believe him when he says Parker isn't aging--he clearly is. The physical descriptions are no longer of a young man. But time is definitely passing slower for him than for the world around him. He was essentially trapped in amber during the long hiatus. The interview is fascinating--I've seen some of the same general comments from Westlake in other interviews, but he gets into more detail about some things here. One little tidbit I can share--Westlake says that he tried writing Parkers up until about 1980, and then he basically gave up the character--says Parker was dead for him. I'm just reading "Good Behavior", the sixth Dortmunder, published in 1985 (and presumably written a while before that). The dedication in front reads "In memoriam: P., 1961-73." For a moment there, I was thinking "My God, did he lose a kid?" Then I realized the dates ran from when he first started writing The Hunter until when he finished Butcher's Moon. He was very very real to Westlake. That's why he couldn't publish any books about him until he himself could believe it really was Parker he was writing about. 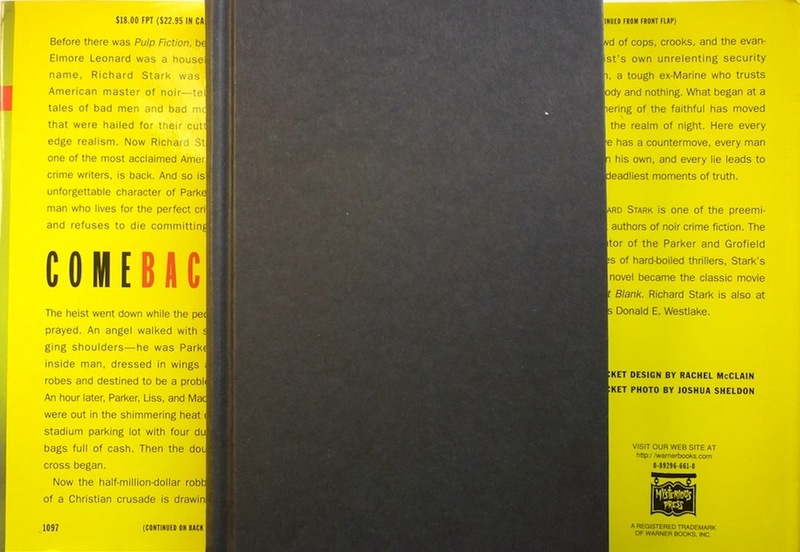 And whatever the failings of Comeback as a book--and I find them fairly slight--it's Parker. The other thing I note with some sadness in the interview is how Westlake says the most important thing to understand when you're adapting somebody else's work is to get to the essence of what the original writer was saying. Certain people I could name never learned that lesson. As we shall learn in the very near future. Glad to have you back on Parker patrol, Nick. It's interesting to learn that you and Chris have reservations about the later Parkers; for me they are some of the best: more literary than before, but just as fast-paced and amusing as ever. 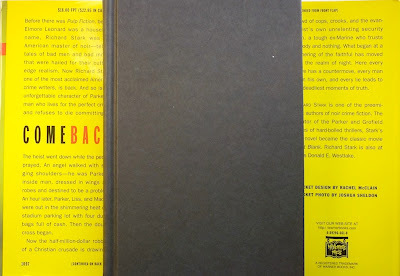 COMEBACK is certainly in my top five. I was looking at your Westlake page again when writing this post – all but one of the later Parkers gets the four-star-favourite mark. I hadn't registered a Leonard influence in Comeback, but you may well be right – they certainly read and admired each other. Ethan, I wouldn't say I have reservations about the later Parkers--some of them I really like, some of them I don't (Flashfire is, for me, the weakest of all the Parker books, yes even worse than The Black Ice Score, but still very readable and interesting and about the worst choice imaginable to kick off a film franchise, but never mind that now). I think the original series is far better, certainly more exciting and original, but I may feel that way in part because it's the work of a young man--full of confidence and vigor and exultation in the creative process. The later books are an older man's work, a man who can feel death nipping at his heels, like a pack of police dogs. It's not a question of if Parker goes down, but when, and he knows it. And typically, he doesn't worry about it. Because he's better than the rest of us. 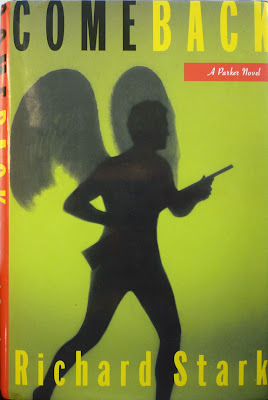 Belatedly adding a comment that much as I appreciate Mysterious Press publishing the return of Parker, the dust jacket art is truly awful--improved gradually as the new series went on, culminating with the excellent artwork for Nobody Runs Forever. The only one I'm missing is Backflash – most of the Hale edns went to public libraries, and I've yet to find a copy that isn't ex-library. I can't say I'm a huge fan of Colligan's covers either, but as I say, cover-wise, not exactly spoilt for choice on those later Parkers.